Start with stretched and detangled hair. As you style work with your hair section by section. Be mindful of the fullness you desire, keeping the density of your hair in mind. For example, if you have low density hair (thin) and you want a more full look do more sections. Start off by either tightly twisting or braiding your root, then transition to loosely two strand twisting your hair and complete the plait you are working with by tightly two strand twisting down to your ends. 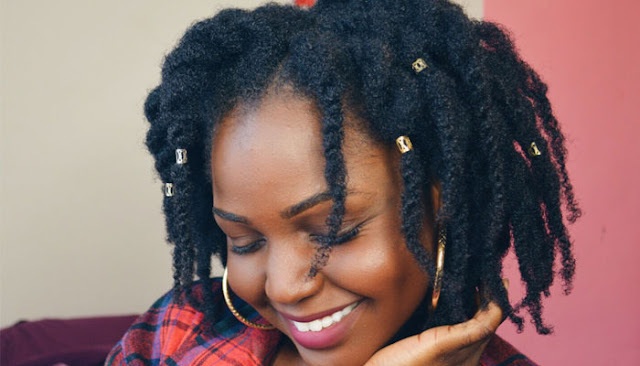 What’s great about loose twists is that you are not limited to just wearing them one way. You can style your hair in a variety of ways without the risk of over manipulation and breakage that may come with other styles. To maintain this style simply moisturize your hair and wrap your hair up at night. When you moisturize use water or a water based product and then seal the moisture in with an oil or butter. Make sure you give your ends some love when you moisturize to get the best length retention results. Loose Twists are considered a low-manipulation style (minimum to no daily styling required). However, they can also be a protective style (styles in which your ends are tucked in) if you choose to wear them in buns or updos. Initially there is a time investment to install them, but they are easy to do even for beginners to styling. This long term style can be worn anywhere from 2 to 3 weeks, offering you convenience and the benefit of no surprises (bad hair days) when you wake up in the morning. Can’t beat that!